There are many factors that contribute to weight loss, the most popular one being exercise. And, yes, it certainly is essential. If you’re not actively moving your body on a regular basis you’re far less likely to be losing any excess body fat. But is exercise the most important aspect when it comes to weight loss? The short answer is no, it’s not. You can exercise all you like, but at the end of the day if you replenish those lost calories with fatty convenience foods you probably won’t be shedding the extra weight. Okay, so food’s important. But can’t you just limit how much you eat and lose the weight that way? Isn’t everything really about calories in, calories out anyway? Well, sure, but calorie-restricting will only get you so far. This can be seen with those on the never ending weight loss, weight gain hamster wheel that’s fueled by a “just use portion control” mindset (like the approach used by weight-watchers and others). But who really wants to lose weight for only a month or two, especially if you’re likely to gain back even more later? Wouldn’t you rather lose the weight and keep it off—for good, without feeling like you’re depriving yourself? So how do you lose weight sustainably, without having to obsess over portion sizes and the caloric intake of every meal from now till forever? As you’ve probably heard by now, going plant-based can do wonders for health and weight loss. And living plant-based can do something excessive exercise and “yo-yo” dieting can’t do—provide a sustainable lifestyle that can maintain the weight loss long-term (because it’s more about the food). But as many, and maybe even you, have experienced going “plant-based” isn’t always enough. Even if great improvements were experienced at first, over time they may have plateaued, particularly weight loss. So how do you get things going again and continue to experience the many benefits of plant-based living? The answer is whole plant foods, with an emphasis on nutrient-dense foods. Now that sounds simple enough, but what does it really mean? And, more importantly, how can you put it into practice? Although the specific foods people choose to eat may differ, there are some general principles to follow to maximise weight loss. And you can always adjust things as you go to suit your weight loss needs and personal preferences. To help you begin, here are 11 tips to follow to lose weight on a plant-based diet. Plus, this just so happens to be the healthiest way you can eat too! Plant foods in their whole form have more nutrients, one of the most important among them being fibre. High fibre foods like whole grains and legumes are typically more satisfying and filling, not to mention more nutritious. Eating whole plant foods as close to their natural form as possible is best. This means limiting processed foods made from flours and refined ingredients. For instance, choose apples or bananas over fruit juices, sweet potatoes or chickpeas over pasta or crackers, and brown over white rice. With a higher vitamin and mineral content, raw fruits and vegetables are the healthiest foods you can eat. And they’re good for weight loss too. On account of their greater volume, water, and nutrition content, they fill you up and leave you more satisfied after a meal. So adding fresh fruit and colourful salads packed with vegetables to your daily diet will help speed up weight loss by ensuring that you stay satiated. Which means you’re less likely to find yourself thinking about and searching out less healthy options. You know, like on those midnight kitchen cupboard raids? Fruits, vegetables, whole grains, and legumes are the whole, nutrient-dense foods that should make up the majority of your diet. They have more nutrients and fewer calories per serving, which is just what you want. Because long-term, sustained weight loss is all about satiety. That’s why your food choices should be focused on nutrient-density. Plant-based dietitian and nutritionist Jeff Novick, MS, RD has a number of good nutrient-density principles to follow for weight loss. For health and weight loss, you’ll want to avoid added salt, oil, and sugar. Oil in particular adds unwanted extra calories, while sugar and salt encourage you to overeat. They are all addictive and lead you to eat when you don’t really need to. Besides, they don’t contain any nutritional benefit. Quite the opposite, actually. They contribute to the “dietary pleasure trap” as outlined by Dr. Alan Goldhamer and Dr. Doug Lisle in The Pleasure Trap, a book that has been highly praised by many leaders in the plant-based movement. So, take them out of your diet and cook without oil, avoid oil-based dressings and sauces, and select oil-free products when buying packaged goods. Also look for options that are free from added sugar or salt. Simple adjustments to recipes can make many of them salt, oil, and sugar-free, but starting with an already oil-free, vegan recipe can make things a lot easier. The less you eat salt, oil, and sugar, the less your body will want them. Your taste buds will adjust. You can get all the sodium you need from whole, natural foods as Dr. Goldhamer points out here (skip to 2:30 in the linked video). Making your own homemade vegetable broth is a good way to have an SOS-free liquid that is full of flavor that you can add in as you cook your meals. In particular, a touch of vegetable broth works well for “stir-frying” vegetables without oil. To lose weight on a plant-based diet, eat lower in fat (and protein). Ideally stick to around 10% or less of calories from fat and 15% or less from protein, at least at first. In order to successfully eat low fat, removing oil from your diet should be the priority. Once that’s out of the way, you’ll want to keep nuts, seeds, avocado, and other fattier foods to a minimum. Instead base your meals around fruits, vegetables, whole grains, and legumes. Use nuts and seeds more as condiments rather than a primary calorie component of the meal. Eating cashew or coconut-based sauces or recipes every once in a while is fine, but try not to make them a frequent part of your diet. More than half of your body is water and it needs to be replaced. Digestion and exercise require a lot of water and after eight hours with no food or liquid your body’s water supply needs replenishing. So drink water each morning and throughout the day, prioritizing it over other beverages. Being salt-free and eating plenty of raw fruits and vegetables will also help keep to your body hydrated. Yes, a calorie deficit is always needed to lose weight. But if you skimp too much on food intake you’ll be unlikely to stick with it long, and you may end up binging on who knows what. Plus, it’s not good for athletic performance or maintaining muscle mass. 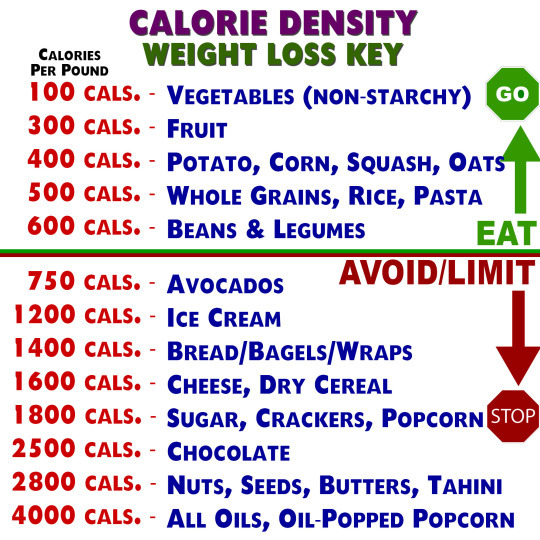 You don’t need to fixate on calories, but having a rough idea of how many calories you are consuming can ensure that you eat enough. Tools like Cronometer can give you a general idea of the calorie content of the foods you’re eating. This is especially important if you’re being quite active, since under eating and a lot of activity don’t go well together. And it certainly isn’t sustainable long-term. If you’re not consuming enough food to support your activity level your body will burn through your available muscle supply. Sure, you’ll be losing weight, but probably not in the way you’d like. As sport nutritionist Dan Benardot, PhD, RD, LD, FACSM explains here, fat loss shouldn’t be your only priority (skip to “Weight Loss vs. Fat Loss” in the article). Because building and maintaining muscle is important too. Eat foods and recipes you like and that you will stick with. Eating well for a couple of weeks then jumping off the health train for a while, so to speak, before clambering back on again isn’t the best approach. Find a way of eating that you can stick with day after day, week after week. Tailor your food choices to suit your lifestyle and your needs. For instance, if taking a packed lunch each day is the best, and healthiest option for you, then make an extra effort to prepare your lunch the night before. Maybe save a bit of salad from dinner and make sure there are some other leftovers that you can put together and take the next day. Do what works for you. And keep at it. Meals that don’t take long to prepare are good. The less time spent thinking about what to make and how to make it, the better. Being familiar with a handful of go-to recipes will help. So find a few favourites you like and get used to making them. The more familiar they are the less “work” it will feel is required to make them. Also look for meals that are easier to prepare. Recipes that use leftovers are always helpful, such as whole food or Buddha bowls where you can use any extra brown rice, beans, or chopped vegetables you have in the fridge. Batch cooking is another good way to go. Preparing meals ahead of time or cooking up rice and beans for two or three days in advance will especially help on busier nights. Following on from efficient meal prep, eat simply. Choose a few meals you like and eat them repeatedly. The repetition will help with weight loss, particularly during the transition period as you develop healthy eating habits. Further, keep food simple by avoiding stimulating foods and additives that will encourage you to eat more than you really need. This includes salt, oil, sugar, and even spices. Eating most of your meals as simply as possible will help to re-program your body so that you are eating because you’re hungry and not because you just want to eat. It’s easy to pack on extra weight when you eat without really thinking about it. So to lose weight, avoid snacking just for the sake of it. To help in this regard, as much as possible avoid multi-tasking while eating. Try to pay attention as you eat, enjoying the flavours of the foods. That way you’re more likely to stop when you’re full as opposed to missing the signals that you’re body doesn’t need any more. This is often what happens when snacking on a supersized container of popcorn while preoccupied watching a movie. The taste of food often loses its’ appeal when you’re no longer hungry. And the cleaner and simpler you eat, and the more mindful you are during the eating process, the more in-tune with these signals you can be. Choose foods and recipes you enjoy. Keeping it simple is good, but that doesn’t mean you can’t look forward to your meals. Eating just shouldn’t be the highlight of your day. Build your meals around whole plant foods you know you like, but don’t be afraid to try new ones either. And seek out the highest quality foods you can. The more nutrient-rich and ripe a food is, the better it’ll taste. So, choosing local, high quality produce that’s in season can go a long way to enjoying your meals more. Visiting local farmers markets, taking part in a CSA, or going to the farm itself will provide you with higher quality produce and it’ll get you more aware of where your food is coming from, which is never a bad thing. Even grocery stores often carry a supply of locally sourced produce and products. But don’t forget, as much as whole plant foods are the best fuel you can feed your body, they are just that: fuel. So eat to live and do the activities you enjoy, rather than living to eat. Eating plant-based with an emphasis on nutrient-dense, whole plant foods is one of the healthiest, most satisfying ways to lose weight, and keep it off. You can enjoy your meals while nourishing your body with the best fuel the planet has to offer. Plus, creating a lifestyle that supports healthful living, centred on whole food, plant-based eating will have ripple effects that extend to all areas of your life. You’ll likely feel better and have more energy to be active, which is a win-win. But attaining a healthy body weight is just one of the many benefits you’ll experience as a result of eating this way. So develop healthy eating habits following the above principles to lose the extra weight and keep it off long-term! You can get started with healthy oil-free, vegan recipes.